Surprisingly, the most energy intensive steps in automotive manufacturing are the coating processes. Not only does it take a lot of energy to coat your favorite ride with the latest colors and finishes, but the process also emits a large amount of volatile organic compounds (VOC) and CO² gases into the atmosphere. At Dabler Auto Body, we are aware of the energy we use, and conscious of the chemicals and compounds that our shop may emit. That’s why we have chosen to use BASF 90-Line paints in our shop, use all the latest energy saving technology, and practice the most up-to-date techniques and practices. We also use low VOC clear coats, and recycled solvents for cleaning paint guns and other shop items. As one of the leading automotive coatings suppliers in the world, BASF has had extensive and in-depth cooperation with car manufacturers around the globe, not only in research of color design and trends to make cars look fashionable, but also in being actively involved in the coating process, exploring eco-friendly automotive coatings, coating processes and solutions. This is to help car manufacturers tackle the severe challenges of balancing economic effectiveness and ecological efficiency. Located in Shenyang, Liaoning, the Tiexi plant of BMW Brilliance is one of the most eco-friendly and sustainable paint shops in the world, albeit with the lowest energy consumption. As one of the major coating suppliers of Tiexi plant, BASF provides advanced and eco-friendly e-coat and waterborne basecoat. Through the streamlined Integrated Process (IP), BASF helps the Tiexi plant reduce production costs and the consumption of raw materials and energy, effectively control the emission of VOC and CO2 and increase productivity. In 2012, BASF conducted an in-depth Eco-Efficiency Analysis of Global Coating Processes in partnership with Durr, a coating application manufacturer, to measure the impact of sustainability initiatives on a paint line’s full eco-system. The report outlined three ways today’s coatings teams can improve process sustainability. Use an integrated process – It reduces CO2 emissions by up to 20 percent, saves energy costs by as much as 20 percent and reduces material consumption and improves productivity. Embrace a waterborne system – Thanks to the significantly lower level of emissions of solvents or volatile organic compounds (VOCs), waterborne systems show strong results with respect to Eco-efficiency. Incorporate modern paint line and application technologies – There are potential sustainability savings available with respect to energy consumption of spray booths if they are operated in recirculating air. This is especially important if the line uses a solvent borne paint. Be rest assured, not only will you get the best support and service in the auto body industry, but Dabler Auto Body is always looking out for the community and the environment in everything we do. 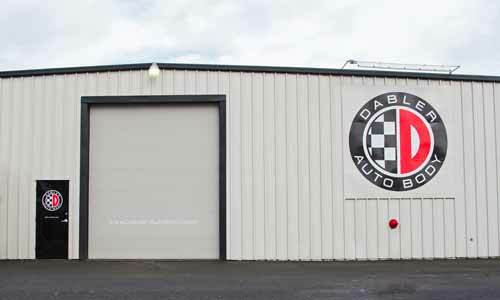 Next time you need some auto body work in the Salem, OR area be sure to give us a call! This entry was tagged ASE Certified, auto, auto body, auto paint, automotive, BASF, Bmw, body, CO2, eco-friendly, environment, equipment repair, finish, frame, global warming, lifetime warranty, oregon, paint-less dent removal, repair, Salem, technology, tips, VOCs. Bookmark the permalink.